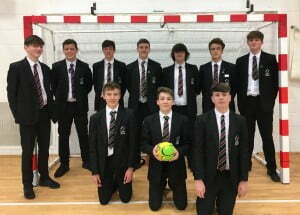 The year 10 handball team competed in the Lancashire school finals at Ewood Park Indoor centre. The team won the whole tournament and were un-beaten. They will now go on to represent Lancashire in the North West handball finals. Well done to all! Team consists of: James Littlefair, Joe Whitlam, Joe Ryan, Luke Westall, Lewis Hughes, Ben Larnach, Ben Beck, Macken Slater, Sam Walsh and James Catlow. 32 Gymnasts from Unity College took part in the Burnley Gymnastics High School competition, on 10th February at the Best Training Centre. For the first time in Burnley High Schools history boys have also now had the opportunity to perform. Out of a possible 27 medals, Unity took a clean sweep and brought home 15 medals ranging from Gold, Silver and Bronze for individual, paired and vaulting performances. Level 2 floor winner was Amy Smith, followed by Megan Irwin who took the Silver medal. Level 4 floor medallists; Jodie Hammet took Bronze, Harley Gill took Silver and Rhianna Doogan was the overall Level four winner. Olivia Hickey and Elle Cadwick won Gold in the level one pair’s competition. Hebe Limmer and Mace Williams took Gold for pair’s level two, followed by Grace Johnson and Paige Heap who won Bronze. First place, with a fantastic score of 9.4 out of 10 was Charlie Brewer, followed by Declan Stewart-Bastable who took third place overall. Unity boys won the overall team vault medal, the Gold medallist include students Charlie Brewer, Declan Stewart- Bastable, Akib Mahmood and Jayden Roberts. A fantastic morning with some inspirational routines. Well done to all students who competed. A big congratulations to Jackson McKay who has secured a place in the U13 Boys Lancashire Cross Country Team. Jackson has worked hard to get his first Lancashire vest and is excited at representing the county. The team will next be competing at Loughborough on Saturday 11th March. Jacksons’ parents and everyone at Unity College are very proud of him as it is very competitive and the standard is high. Well done Jackson! Natalya Irvine, in Year 11, has also been chosen to represent the Lancashire Cross Country team in the U20s age group which is also a fantastic achievement! Well done Natalya! Please congratulate our U13 Indoor Cricket Team that won the indoor tournament. This was a feeder competition that leads on to Unity College representing Burnley against the best teams from all the other towns in Lancashire. Well done all! Year 9 boys’ football: the Lancashire cup match v Ormskirk School finished 1-1 at full time and a last minute extra time winner saw Unity win 2-1 and progress to the next round. Ben Cole made some incredible saves which drew praise from teammates, opposition and the match official. Year 7/8 boys’ rugby- despite a predominantly year 7 team in a year 8 competition the boys played fantastically and even managed to win one of their games against Unity Academy. Adam Broxton in particular put in a fantastic performance in leading the team. Year 7/8 boys badminton: in the first Burnley schools Key Stage 3 badminton competition the boys played really well against largely Year 9 opposition. Their performance impressed many of the staff from other schools considering that three of them came from year 7. Jack Beharrel showed good determination to win a singles game against a player from the eventual tournament winners. Rugby at Unity College has been up and running along side the Rugby World Cup 2015. So far the year 8 team have played Clitheroe Grammar school in the Emerging schools cup. The year 7’s have attended the pitch and play event at Burnley Rugby Club with 24 1st years taking part. Last week we hosted St. Wilfs and Clitheroe Grammar year 7 teams in friendlies which inspired several students to train and take part in a club game for Burnley Rugby Club on the weekend! 9 students played in the U12 side against North Ribblesdale. This week the year 7’s will compete in the Emerging Schools tournament in Blackburn with the year 8’s in action next week in the same competition. Good luck to all the players selected! North West Ski Federation / Schools Race 2015 / Individual Slalom & Team CompetitionUnity College students took part in a ski competition which took place at Pendle Ski club on Saturday 21 March. Unity competed against 34 teams and finished 13th! This was a brilliant result for the team. The children had a really good day and the twins, Eleanor and Harriet, times had a 100th of a second between them both! Unity also came 5th out of 12 in their age category which fantastic. A lovely evening of rugby took place at Unity College last night. A combined Hameldon year 7 & 8 team visited to take on our year 7’s in a friendly game. Although Hameldon raced into a 10 – 35 point lead at half time our boys gave as good as they got in the second half with many players making excellent runs and having to tighten their defence and tackling. As the second half began St. Wilfreds turned up with their B team. After the traditional tunnel and shaking of hands with Hameldon, Unity then played a second game in the same friendly fashion as the first. All 20 of our players had game time which, for the new contingent of players who have only recently joined the squad, was very useful to see the potential for a fantastic year 8 campaign. Well done to everyone who contributed to the games and the recent finals. The rugby season has now officially ended and after the Easter break, Mr Williams will be taking athletics training on Tuesdays after school. Year 7 Lancashire Rugby FinalUnity College took to the fields of Blackburn Rugby club to compete in the All Schools Lancashire finals as part of the £10,000 investment by the Rugby Football Union in schools. The team performed admirably and always adhered to the rules of fair play even when the opposition were less that gentlemanly in their conduct! Although we did not win the event, the experience proved the qualities the team has and the potential that they will grow together as a strong squad over the next couple of years. The competition was also remarkable as there was the largest year 7 Mr Williams has ever seen playing – 6ft 3 and about 13 stone of muscle. The advice to our youngsters is eat your greens, pasta and proteins so that we can catch him up and give them a game in year 9 when we have all had a chance to catch up (even Mr Williams would have had trouble tackling him!). The rugby season is drawing to a close but with the girls U13’s coming 2nd in a Lancashire final, the U15 girls in a Lancashire final, the year 9 boys qualified for the quarter finals of the emerging schools trophy, the year 8’s in the semi-finals of the emerging schools cup and year 7 squad in the All Schools Lancashire finals the year has been pretty successful. The year 7 team have a fixture against Hameldon and St. Wilfs before Easter and the year 8’s are playing in their final game the first week after Easter. Next year we will be running teams at U13 and U15 for girls and year 7 and 8 for the boys teams. If there are any parents who would like to help coach the team please get in touch with Mr Williams at school. This week saw ex-student Daniel Collinge achieve a personal best and his first sub-17 minute time. He led the run from beginning to end with a time of 16.52 minutes. Jordan McDonald, another former pupil, was 1 second off his best time in 17.29 minutes in 4th place. George Pier completed a trio of Unity College Alumni in 7th place with his own personal best of 18.28 minutes. The winner of the recent primary school elite competition, Sophie Ashworth (a year 6 student at St. Stephens and soon to be Unity College student), was the next home in another formidable time of 24.04 minutes. On a day of new PB’s Willow Bell smashed her best time down to 25.07 minutes. It’s sub-25 minutes for Willow next! Next in was Kim Burrell making his debut at 29.39 minutes with Mr Burrell recording a PB on 29.40 minutes. Aaron Lundie finished in 33.18 minutes and has one more run to collect the awesome achievement of A QUARTER OF A MILLION MILES! Mr Williams will also award him a special vivo award of 500 Vivos! Steven Taylor, finishing in 33.53 minutes, is hot on the trail of that award as well, completing his 20th Parkrun. Well done to everyone who competed. Mr Williams was there to clap the runners along as he was applying the principle of rest and recovery to his aged legs ready for a good run next week! Unity College took part in the girls under 13 and under 15 Lancashire finals for the second year running. Although the U15’s played their hearts out they were outclassed in many games, especially with their top try scorer missing through illness. However, they produced one win and some very memorable moments. Sinade Taylor braced herself as a girl who represented the North of England built up speed and ran straight at her…….. the resulting collision drew gasps from the crowd but Sinade was unscathed. The other player was stopped dead in her tracks. Georgia Dobson-Pilling also danced and bulldozed her way through several players to score. Cerys Ellis was a constant thorn in the side of the opposition and Macey Durkin chased and tacked all tournament, ably supported by Camille Murray. Abby Lord, Lucy Kelly and Pauline Morton worked hard – constantly scrummaging and moving around the pitch. Mia Rutherford gained a wicked stud mark and was impressive at scrum half. The under 13’s imitated the under 15’s side in their effort levels but their story was a different one. Their first game, against local school Blessed Trinity, ended 25 – 20 to Unity College in a very evenly matched game. Their next opponents Knowlsey were a different kettle of fish. They were fast, big and organized. However, they followed their tactical instructions to the letter and despite Knowlsey having lots of possession and attacking for large periods of the game they tackled like trucks and disrupted their play until, 2 minutes from time Unity scored the only try of the game! In the final the winners would receive rugby world cup tickets. St. Marys looked a similar team but turned out to be a very organized unit. Unity, exhausted from their battle against Knowsley, battled throughout the game but St. Marys were too organised. We scored a consolation try to end the match 5 – 20. They were each awarded a silver medal for their efforts and invited to more tournaments by officials who were impressed with their rugby. The girls who represented the U13’s were: Jennifer Todd, Tabetha Burrell, Willow Bell, Sasha Evans, Holly Parker, Kayley Hughes, Ariane Limmer, Lydia Cryer, Hollie Nicholls, Megan Horan. U13’s Lancashire Indoor Cricket FinalQualified by winning the Burnley Qualifying competition. In this competition we beat Burnley High School and Blessed Trinity in the final which meant we qualified to represent the town in Lancaster’s Final. This took place at Salt Ayre Sports Centre. We unfortunately lost both of our games against St Bedes from Blackburn and Broughton High School, Preston. The boys performed really well and represented the college with pride. Boys names top row L to R – Daniel Mahmood, Luke Westall, Waqas Suleman, James Littlefair. Bottom row L to R – George Sumner, Zain Mahmood, Haider Khan, Anthony Barrett and Aranvir Chahal. Clayton-le-Moors runner and ex-student Jordan McDonald finished in 3rd place in a time of 18 minutes. Mr Williams, in the absence of our current elite runners, came trundling in next with a time of 24.20 minutes, in 55th place.First timer Harry McIvor, who has been studying methods of training in PE, was a welcome addition to the Parkrun. Unfortunately there was some mix up with his results but he was not too far behind his teacher, finishing between 25 and 26 minutes. Well done Harry! Aaron Lundie ran even whilst not feeling well (so he can mark his 50th run on his birthday!) and still posted a good time of 33.22 minutes, as did Edmund Stead who took approximately 20 seconds of last weeks’ time. Steven Taylor, a regular park runner now, completed his 19th run – almost halfway to your 500 vivo reward for completing 50 runs – good going Mr Taylor! Bailey Bland also took part but the results show several ‘unknown’ finishers so well done to Mr Bland for taking part and hopefully we will see you on the names next time! On Thursday 12 February Unity College students took part in the Burnley Schools Gymnastics Competition. Their performances to say the least were outstanding, which resulted in coming back with a flurry of medals! Within the individual category Ocean Odudu came 2nd with Arianne Limmer 3rd place at Level 1. Brilliant performances from Lydia Cryer and Emily O’Keefe ensured they came an overall 1st place in the team event! At Level 2 Claire Hermansen scooped Gold with Willow Bell gaining Bronze and along with excellent performances from Kia Thorley and Charlotte Green the team came in 1st place! Within Level 3 superb routines from Millie Walsh, Kerris Baron, Hermoine Blythe and Morgan Denney gained them 2nd place in the team event. We were also the only school to enter a student at the highest level of the competition – our exceptional gymnast Rhianna Doogan put on magnificent display of high level gymnastics! An acrobatics section also took place which requires pairs to perform a routine together combining individual moves with partner balances. Within Level 2 of the competition Unity students picked up Gold and Silver! The winning students were Millie Walsh and Rhianna Doogan with Morgan Denneny and Leah Briercliffe in 2nd place. Well done to all students who took part in the competition, all their hard work undoubtedly paid off! Four Unity College students took part in this week’s Burnley Parkrun. Natalya Irvine finished the 5k course in a respectable 23.02minutes with Willow Bell, the year 8 all-round athlete finishing in 27.34minutes. Mr Williams/PE Teacher and his son Murphy, a future Unity College student, crossed the line at 35minutes exactly, closely followed by a strong finish from Aaron Lundie on 35.07minutes. Steven Taylor narrowly missed out on a new personal best by 3 seconds. Aaron was also recently awarded park runner of the month for his commitment, perseverance and improvement and received a very nice pair of running trainers to help him cover the kilometres from the lovely organisers of the park run event, well done Aaron! Students representing Unity College rugby team have another new kit thanks to the All Schools funding programme from the Rugby Football Union. The kit, designed by Unity students Brody Slater, Sam Wallwork, Bobby Beswick and Morgan Williams, was made by kit makers Canterbury especially for the school. 5 years ago Unity College became the first school in Burnley to have a rugby pitch on its school fields since the 1960′s and this week Unity College continued breaking new ground and spent more of it’s All Schools Award funding from the Rugby Football Union, to create a second pitch. Cerys Ellis, Lancashire U15 rugby player, who has also just qualified on her rugby ready and scrum factory courses said about the new developments ‘With all the rugby that goes on at school we needed another pitch’. Cerys is part of a growing section of girls who have excelled after taking up the sport. Cerys, along with Emma Wall, Macey Durkin, Polly Bell and younger sister Willow Bell will take part in the North of England rugby trials after playing regularly for Lancashire and Burnley. Unity U12′s and U13′s boys teams are in action over the next couple of weeks in the East Lancashire All Schools tournament and the U14′s take part in the next round of the Emerging Schools Cup. Boys and girls training takes place as usual every Tuesday and Thursday after school. Pictured are some of the players at training on the new pitch. Before Christmas students took part in the annual Unity College Swimming Gala, held at St Peters Centre. There was a highly energised and electric atmosphere around the pool. All students showed the ultimate support for their House. It was a very competitive gala, with friendly rivalry between the Houses and individual success across the board. Students and staff cheered the competitors on in every race. Many races going down to the milli second making the events even more compelling to watch. All students from each of the four Houses did their House proud, with their effort and enthusiasm both in support and in their performance in the pool, in front crawl, breast stroke, back stroke and the relay. In the end, the overall winning House was East House with Samuel Murray and Natalya Irvine getting the fastest times on the day. Congratulations also to Lydia Cryer and Chloe Waddington for winning Gold in their individual events and Gold in the year 7 relay, both from East House. Well done to South House who made the best progress from last year’s results. Also congratulations to Ryan Connolly from South House who won Gold medals in back stroke and breast stroke. All Students showed exceptional commitment including Kim Sykes and Kim Burrell from West House, Rachel Kay, Georgia Ashworth, Emma Wall from South House and Regan Burnie and Harvey Fletcher from North House.